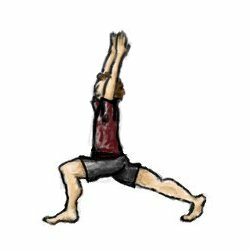 I recently attended a yoga class in which the instructor had us flow through this twisted backbend variation on high lunge, and I just loved it! 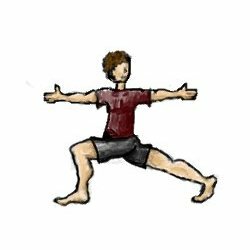 Start in high lunge with the left leg forward and right leg back, making sure the left knee is right above the ankle pointed toward the second toe of the foot. Keep the back leg long without locking the knee, and press back through the back heal. Breathe. If this next bit feels a little awkward, you’re probably doing it right. Keep your base strong and on an exhale, lower the arms to shoulder height, extending the right arm forward and left arm back, thumbs up toward the ceiling. Twist the chest toward the left, and turn the gaze toward the back hand, if that’s available to you. Keep contracting the obliques (the side abdominal muscles) and resist the urge to lean forward. Breathe. Contract the abdominals, and on an exhale, lower the left hand down to the back thigh and turn the right palm skyward. Inhale, extend the hand upwards so that the palm of the hand faces the back of the room. As you exhale, begin to back bend to your degree. Keep breathing. 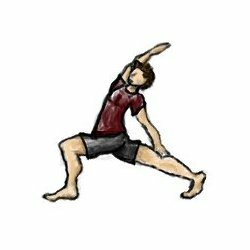 To get to the same sequence on the other side from here, inhale out of the backbend, exhale to windmill the hands all the way down to the floor, and cycle through a two- or one-legged vinyasa. From downward facing dog, step the right foot forward and inhale the arms up into high lunge. The typical arm position for a crescent lunge is arms extended upwards, shoulder width apart, with the palms facing each other. Changing up the arms up arms targets different muscles and make your practice more interesting. 1. Instead of keeping the arms shoulders’ width apart, press the palms together, interlace all ten fingers, then release the index to point upwards. The arm variation promotes shoulder flexibility, and gently stretches some of the upper back muscles. Interlace all ten fingers, then release to index to point upward. 2. Find eagle arms. To do this, give yourself a big hug, walking the hands as far back as possible. If you can’t get the hands far enough back to stack one elbow on top of the other, stay here, you’ll get a nice upper back stretch. If you’re going farther, keep the elbow where they are, and bring the backs of the hands toward each other. If you have the flexibility, your hands are actually going to pass by one another, with the bottom hand closer to your face. Feel free to stop and hold the position at any point along the way. Finally, if you can, bring the palms of the hands together, forming a “twisted prayer” with the arms. To deepen into eagle arms, extend the hands forward and the elbows upward. You will feel a stretch in the shoulders and across the upper back. Crescent lunge with eagle arms. An interesting transition into this one is to start in eagle, then unwind the top leg to step straight back into crescent lunge. From crescent lunge with eagle arms, you could transition straight into warrior three with eagle arms. 3. This one stretches a little more into the chest. Place the hand on the same side as the back leg on the back of your neck, opening the elbow backwards. Take the opposite forearm across the low back with the palm facing away from your body. This is a nice gentle stretch for the chest and shoulder muscles, and also gets into the upper back a little bit. This position also provides a more support for people with weaker core muscles. 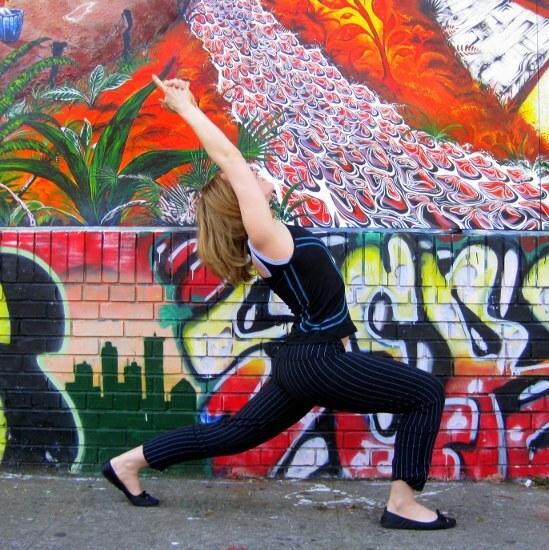 Crescent lunge with one hand across the low back and the other on the back of the neck. Make sure that whatever you do on one side, you balance out on the other side.